When I was a kid, there were so many things I wanted in this world that I could never have. I wanted magic to really exist, for starters, and I really wanted a pet dolphin for our pool but only if he didn't resent living in an above-ground pool. I didn't need the hassle. I wanted Wonder Woman to come to my birthday party, but not some actress pretending; actual Wonder Woman. My mom laughed at all of this nonsense. Maybe she should have taken a lesson from this mom who wants to "borrow an orange cat" for pretty much the sweetest reason ever. So there's this mom out in the world who is now internet famous because of a poster she put up in her office. According to a tweet from a woman in Oklahoma City, Oklahoma, a mom asked her co-workers if she could "borrow an orange cat" and don't worry, she specifically went out of her way to tell people that she might be "desperate (but not crazy)." I mean, that's always a bit of a relief, isn't it? Nobody wants to be loaning their popular orange cat out to a "crazy" person, am I right? Her reason for wanting to borrow an orange cat? To give her kids the chance to eat lasagna with Garfield. 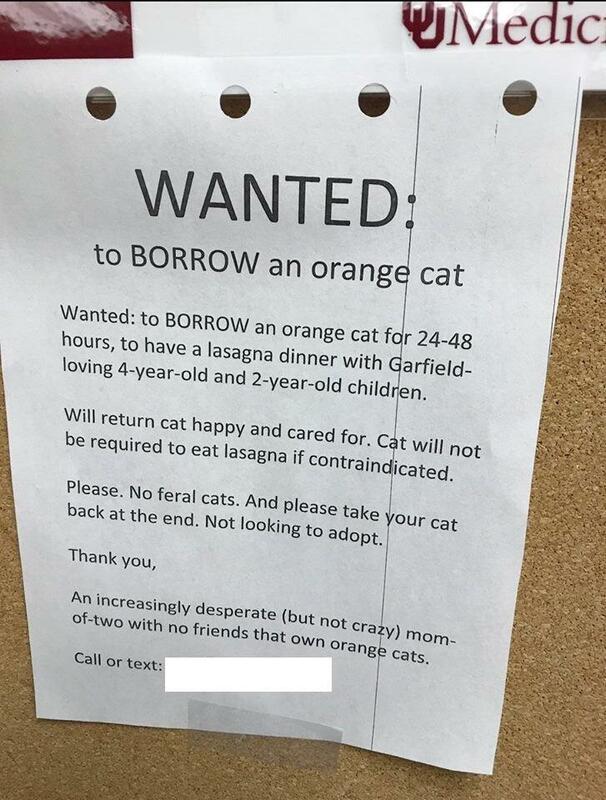 Wanted: to BORROW an orange cat for 24-48 hours, to have a lasagna dinner with Garfield-loving 4-year-old and 2-year-old children. Will return cat happy and cared for. Cat will not be required to eat lasagna if contraindicated. And now all I can picture is an orange cat sighing and saying to his owner, Fine, I'll do it but I am not eating lasagna! Although think about how disappointed this mom's kids will be if the cat turns its nose up at lasagna. Garfield, the lazy, sly orange cat made famous by cartoonist (and owner) Jim Davis in 1978, would never say no to a dish of lasagna. So shouldn't a lasagna-eating cat be the whole point here? Please. No feral cats. And please take your cat back at the end. Not looking to adopt... Thank you, An increasingly desperate (but not crazy) mom-of-two with no friends that own orange cats. The poster was initially shared by a co-worker's daughter to help this sweet mom arrange a lasagna dinner for her kids and someone else's cat on Aug. 1 on Twitter. Her tweet was then shared on Reddit... and then everything went viral. People from all over started to share pictures of their orange cat on Twitter like the best dating service that could ever happen. My personal favorite? This person who wanted their cat to be considered for the swanky lasagna dinner but seemed concerned that they might not have the curves to pull off the full Garfield, As they wrote on Twitter, "loves kids, other animals, to sit nicely on your lap or get belly rubs, and enjoys all types of food..also has gained a significant amount of weight since these were taken." Fortunately, Clara's husband took to Twitter on Tuesday to tell all of these kind cat-lovers that a winner had been chosen and the lasagna dinner would be happening on Saturday. Apparently a woman, her boyfriend, and her "fat orange" will be enjoying a feast with the kids. I hope the cat eats lasagna, and that he's a bit grumpy and surly and the kids fall for this elaborate ruse hook, line, and sinker. See, Mom? With a little effort, I could have had Wonder Woman to my birthday party.